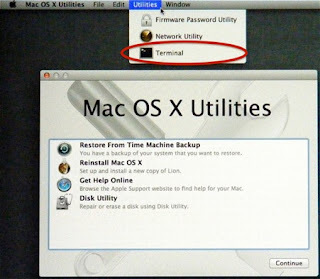 You cannot install any apps as you have to input this password every time (unless you have no admin password), you may be thinking that you will have to format the computer and reinstall OSX so that you can install things again, whilsts this is an option it is also time consuming you can also restore a backup from your time capsule, but this may not fix the issue also as if the admin password has been set since the install then it will still remian on the current install. So i hear you thinking how can we fix this ??? Ok so what we will do today is reset the default admin accounts password, it is pretty simple but you will need to have a copy of the OSX Install Disk. Start from the Recovery HD by holding down the Cmd and R keys while starting your Mac. If that doesn't work, hold the Alt/Option key instead -- that will show a window with all possible startup sources, including the Recovery HD -- select it. you can also use the CD Drive and boot from the disk. Choose Terminal and type resetpassword all together with no spaces and press the return key. To start up from your OSX Install disc, insert it in the SuperDrive or plug in the Software Reinstall drive on a MacBook Air. Wait for the Mac OS X Install DVD window and double-click the Install icon; or power down, then start up while holding down the "C" key. Either way, that takes a few minutes. Select your language when prompted. On the next screen, select Utilities in the Menubar, then Reset Password. Select the drive/partition and account you wish to change. To change the password, type it in both places, and a hint, then click theSave button. 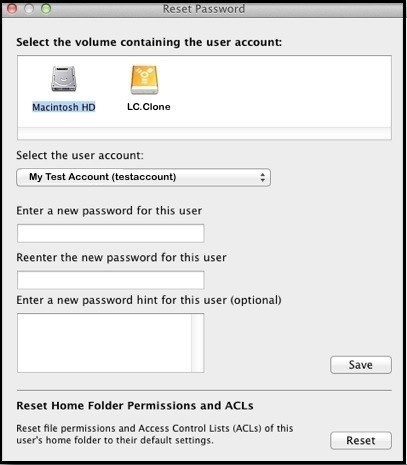 To reset the home folder permissions and ACLs, click the Reset button. Reboot the Mac and there you go the password is now reset without having to reinstall the Operating system and saved yourself heaps of money from not having to take it to the shop. Labels: Reset Mac OSX Admin Password. Are you having issues with Windows Live Movie Maker 2012, this could be because you have a intel onboard graphics card that only supports DirectX 9, if this is the case you will get a message saying that your hardware does not meet the requirements to run the application, this is technically not true. You just need to install an update from microsoft to allow it to run on your current hardware. Follow the links below for both 64bit and 32bit systems and you will be up and running in no time at all. Labels: Issues with Windows Live Movie Maker 2012, You cannot start Windows Movie Maker 2012 when a graphics card that only supports DirectX 9 is installed on a Windows 7. Have you even tried selling items on Facebook ? Never seemed to get a response by a personal message or someone says they have PM'd you but it never arrived in your inbox. This is pretty common and there are hidden messages in your inbox, if like me you dont normally fully open your mailbox just use the drop down menu and click the new message then check this out. Click on the Drop down then onto show all at the bottom on the drop down. You will notice that there is the word Other next to inbox, Click on this and you will see all the messages that are from people who are not in your friends list and probably people who have said they have PM'd you on your selling sites. Once you have opened this for the first time it will then appear next to the word inbox on the drop down menu. Run through the normal uninstall process from Programs and Features, then reboot. Once you have rebooted and you next go to download a file you will notice that it would appear to be still installed. So Open a new tab in chrome. Type (chrome://plugins) into the address bar, find the orbit plugin and disable it. For internet explorer i believe you can just delete the folder in the APPDATA folder in your profile, ask if you cannot find this. Labels: Orbit Downloader Removal - Chrome Users, Orbit downloader.